1) The chef is Jeff Taibe, (brother of chef Bill Taibe from LeFarm and The Whelk) formerly of Southwest Cafe in Ridgefield. He has received lots of great press, so we definitely wanted to try out his food. 2) We love their beautiful patio and were excited for a restaurant to come in that could fulfill its potential. So on a beautiful summer night, we decided to see if we were right on both fronts. The vibe was lively, the fire was roaring in the patio fire pit, the service was attentive, and the drinks were flowing. The space definitely felt revived from its Tuscan Oven days! We started with some drinks, because, well, when don’t we? The wine list was pricey, the cocktails creative, and the beer list a bit disappointing. Nowadays, I think we’ve come to expect some local beer on tap, or at least some awesome craft brews in restaurants that tout themselves as farm-to-table…yet there were none of these things. So, with that, we both started with the Oak + Almond Cocktail which consisted of Four Roses bourbon, luxardo triplum, almond syrup, fresh lemon, Elemakule Tiki Bitters, and a smoked sea salt rim. Wow, this is quite possibly our favorite Bourbon drink ever. Above all, this drink had finesse and balance. At first you get an orange-y kind of taste, but that quickly fades as the great quality bourbon comes to the front. The nice touch is the giant ice cube that keeps the drink cold with less water diluting it. This is a must-order if you love bourbon drinks. Back in 2009, The Sound Magazine started an event to raise money for PAWS of Norwalk that highlighted local music and breweries. As each year went on, the event grew bigger and bigger. This year, the Harvest Festiv-Ale will be at Monster B’s in Stamford. There’s plenty of room there for people…and for beer. The sudsy festival will take place on October 20 from 3 pm until closing time (time for you to go back to the places you will be from). +5 points if you get the reference. You can also chow down on some great Oktoberfest style food from The Park Cafe from Greenwich who will be on hand. Local food, hot shot Chef Stephen Lewandowski from NYC, swanky new space in the new Harbor Point area, ginormous bar, craft beers–from the day we heard about Harlan Social it seemed to have exactly what it takes to be the go-to, happening new spot in Stamford. And, it was for that exact reason that we had to pounce on opening week to check it out for ourselves and see if it was the real deal. When we first found out about Darien Social opening, we were excited at the prospects of having a great hangout nearby that featured a wide selection of beer and elevated bar food served as small plates. Especially since it was created by Nick Biello who was originally behind Burger Bar & Bistro in Norwalk, and once at Habana and Ocean Drive. As the reviews began to roll in, we were seeing a little of everything–the good, the bad, and the ugly. People talked about how great the food was, how bad the food was, how the service was great, and how the service wasn’t so great. Now, we’ve always been the kind of people that take reviews with a grain of salt, so we went in with an open mind so that we could help you guys, our awesome readers, set realistic expectations. When we sat down to our seats, we were immediately recognized by the General Manager, Baird Van Beever. This is when it hit me that with my flaming red hair, it’s virtually impossible to dine incognito. Danny, being a “hata” is getting fed up with me being the one to always be recognized, so he’s working on a gimmick to make himself more noticeable. We’re thinking perhaps his Space Invaders Converse shoes or his use of fun hats like his Spider-man hat, his Fidel Castro, or his Sinatra. Well, come to find out he remembered us from our review on Red Lulu, which he also use to manage so no gimmicks needed. Ok, I digress, onto our experience…. Because we were recognized we really can’t fairly judge the service. For us, the service was good, for others we understand it to be an area for improvement. The one issue we did have was that they brought all our dishes out at once, which is a HUGE pet peeve and drives us crazy! When we order a series of small plates, we much prefer to get them in courses so nothing gets cold and we can enjoy each one at a nice pace. The drink menu here is pretty exciting whether you like wine, mixed drinks, or beer. They even have a local beer selection that changes out weekly. Love that! Just ask your server or check the bar wall to see what brews are available. Danny asked about the Blue Point (from Long Island) beer of the week that turned out to be the RastafaRye, an award winning copper ale packed full of rye and hops flavor. Baird was nice enough to bring us out a complimentary plate of cheeses including Gore-Dawn-Zola paired with elderflower honey, Cloud 9 Camembert paired with sour cherries, and Tarentaise paired with cumquat jam. The cheeses were fresh and were accompanied perfectly with the jams and honey. A very nice start to the meal. They also give you bread to start off your meal. The bread was ok, but the honey butter seemed like it had ben melted then was refrigerated again for storage causing it to separate and become grainy in texture. Lobster Sliders: Holy crap they LOAD the lobster on these bad boys. YAY! The roll was nice and soft and the drawn butter served as a fantastic dip. The cream sauce, however, was a bit much and probably not needed – oh, and we would’ve loved a side of lemon to squeeze on ’em to complement the heaviness of the butter and sauce. This dish also came with a side of German style potato salad that was nice and tangy. BLT Sliders: This was a fun twist on the BLT, that fell just a little short. The downfall was the dish came out cold (boo) and the arugula was a little too dry to really replace a romaine type lettuce. The pluses were the pork belly was cooked nicely with a slight crispiness and the aioli on top was creamy and tasty. Dry Rubbed Chicken Wings: The wings had just the right amount of meat and breading. We hate when wings are either too skinny or too plump with meat, and we hate even more when the yumminess is drowned in a mass of breading. Theirs was right in the sweet spot. The flavor, however, was a little bland which can sometimes be the case with dry rubs. But, we found if you dip them in the hot sauce they put on the side, they end up being tastier. Mac & Cheese: In case you don’t know, I’m a mac & cheese fanatic. And while I like mac & cheese in any way, shape or form it’s served to me, I have to say this was a pretty darn good mac & cheese. The gruyere, bacon and english peas were the PERFECT combo of creamy and tangy with smokey and chunky and crispy and sweet. Then you top it off with some crunchy bread crumbs and you have mac & cheese heaven. Best dish of the night. Dessert: Danny and I somehow reversed roles for dessert because he ordered the bread pudding, which is what I ALWAYS order for dessert. I think I was just too full, so I ordered the creme brulee which was not that great. It came out freezing cold all the way through, even though the top was caramelized like it was supposed to be. The brioche bread pudding was only slightly better though. The bread was not rich and creamy like a bread pudding should be, but rather kind of dry and heavy. The rum raisin sauce and caramelized bananas on top, however, were quite yummy! Darien Social has some good dishes and some “meh” dishes. Nothing mind-blowing (though the Mac & Cheese rocked) and nothing awful (though dessert was a let down). And although decent for us, the service is known to be spotty. If ordering small plates, you should ask for them to be staggered so you have a chance to enjoy them, plate by plate. If you’re coming here expecting an amazing dining experience, you probably need to set your expectations more realistically. What you can expect is some decent food and some great drinks if you play your cards right and order the right things. For now, we have to put Darien Social right down the middle with 3 Noms, but are open to trying it again in the future to see how they’re progressing. But they don’t just stop at the beer, nope. They also have the Hall of Flame. Yup, eat 12 insanely crazy redonkulously hot chicken wings and you’ll get put up on the Hall of Flame, right next to the Hall of Foam winners. So, when my friend (and wing connoisseur) Paul Mueller was coming over for a manly, action-packed Saturday of watching the Stamford Harbor Parade of Lights show and watching The Muppets movie (errr), we knew we had to take him here. He’s just about the most devout wing-nibbler that was ever created on this here Earth. He even just took a roadtrip with his brothers to the original home of the buffalo hot wings: Anchor Bar. Yup. I had these visions in my head of Paul and I, head to head, chomping down through the Hall of Flame challenge. These are some of the best wings that you’ll find anywhere, even better than Vinny’s Backyard BBQ in Stamford. Better than a lot of wings we’ve had beyond CT. Yeah, they’re that good. They were saucy, but not too saucy. The sauce was a bit tangy, a bit sweet, and had lots of bite to it. If you’re into pain and are sadomasochistic, try the Hero sauce. It’s helluva spicy and will knock you on your tookis. We ordered it on the side…smart move. Kristien liked the wings a lot too! They weren’t those mammothly meaty wings that some places serve and they weren’t overly breaded either. Nope, just the right size, just the right amount of meat and so tender and juicy – not soggy and not too crispy. YUM! Paul, ever the rabid carnivore and official Omnomivore too, was thinking about salad but then proudly declared he wouldn’t push the wussiness. He got a 1/2 rack of baby back ribs. Yeah, half a plate was enough, no doubt. 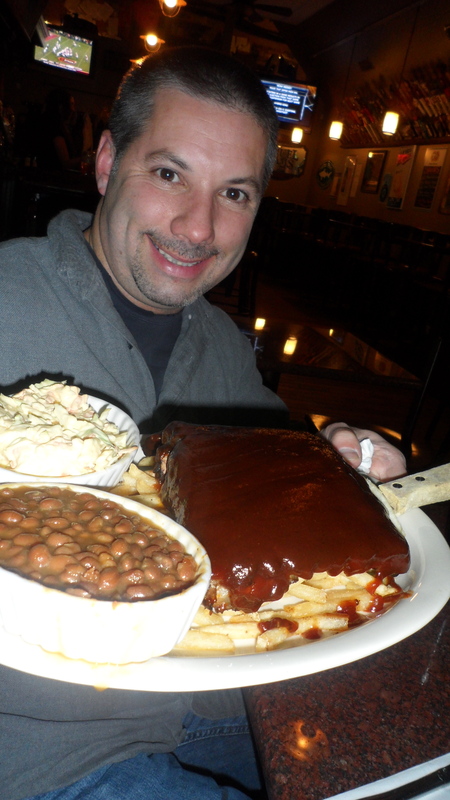 The ribs came to him, smothered in a sweet and tangy bbq sauce and they lay atop a bed of shoestring fries. Paul and I agree that the sauce is decent, but there was just too much of it. The taste of the ribs got lost, but they were still tender and you could easily pull the meat off the bone. We learned that’s good at our Blues, Views, & BBQ judging gig. The coleslaw was swimming and drowning in mayo. Not a favorite of Paul or Kristien, who as you know is a coleslaw expert. Kristien and I got burgers. She’s a self-confessed burger purist, so she got it with her usual cheese, lettuce, tomato, onion, pickle, mayo and ketchup. She thought it was just okay and didn’t have much flavor. My guy was plain and simple too, with onions, tomato, and lettuce. The beef was cooked a bit over medium for us. Although there wasn’t a ton of flavor going on, it was still a decent enough burger for a bar. I would order it again to wash down a beer. The fries, though, rocked it for me. They were crispy and there were so many. 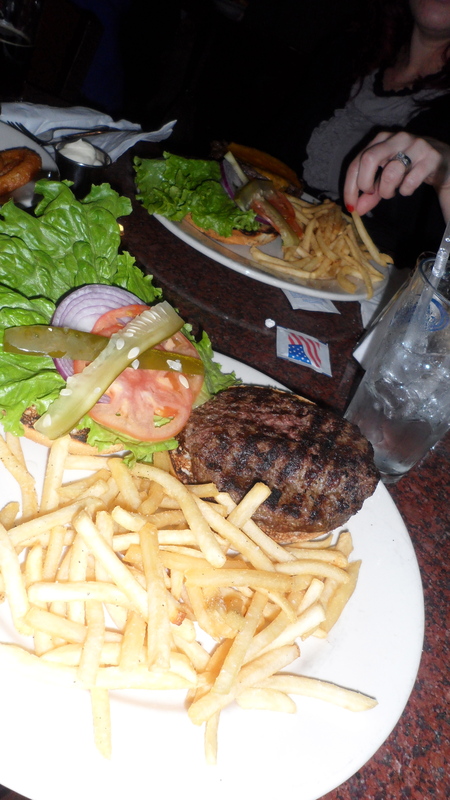 I’m one of those people who can take down half the order of fries before even digging into the burger. Monster B’s is a fun place to go with friends. You can sit at the bar or sit down at some of the tables in the front of the house or in the back. There’s darts, electronic shuffle board, and pool. They have really killer wings and beer selection. 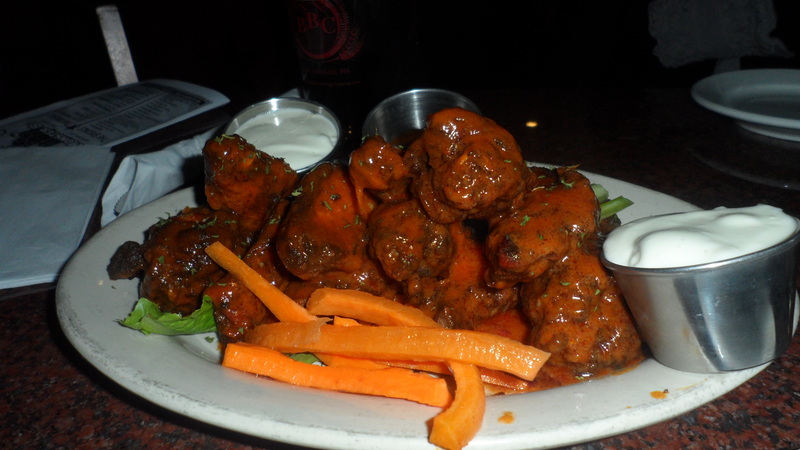 The rest of the food is ok – but the wings and beer are so good they make up for it. Also, you can reap some pretty impressive rewards just by keeping track of your beer consumption. We know that Ryan from Food Plus Beer is on the Hall of Foam and Jessica May from Alternative Control is a fan too. So, we were wondering. Have you made the Hall of Foam? Do you have a goal to shoot for? Maybe the Gold or even the Platinum level? Let us know.